The church has long been a major pilgrimage center for Christians all around the world. 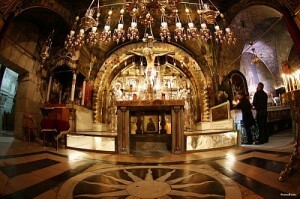 According to the New Testament, Jesus was crucified at Golgotha, “the place of the skull” (Matt. 27:33–35; Mark 15:22–25; John 19:17–24). This has been identified as an area of abandoned stone quarries just outside the city wall of the time. About 10 years after the crucifixion, a third wall was built that enclosed the area of the execution and burial within the city, and this accounts for the Holy Sepulchre’s location inside the Old City of Jerusalem today. The Roman emperor Constantine I, a convert to Christianity, had the temple of Venus in Jerusalem demolished to make way for a church. 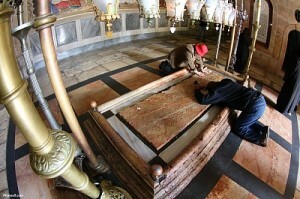 In the course of the demolition a tomb was discovered that was thought to be the tomb of Jesus. The first Church of the Holy Sepulchre was approached by a flight of steps from the Cardo, the main street of Jerusalem. Then pilgrims went through a narthex; a basilica; and an open area, the “holy garden,” which had in it the rock of Golgotha, finally reaching the Holy Sepulchre itself. The rock-cut tomb was initially open to the elements, but later it was protected by a small building. The whole complex was richly decorated, as we know from the description by Constantine’s biographer Eusebius of Caesarea, from pictures in the Church of St. Pudenziana in Rome dating from early in the fifth century and on the Madaba mosaic map from the sixth, and from modern excavations. In 326, Constantine’s mother, Saint Helena, made a pilgrimage to Jerusalem, where, according to legend, she discovered the relic of the cross of Jesus (the “True Cross”). The story of the discovery of the cross was current early in the fifth century, and in the 11th century a cave deep below the ruins of the basilica came to be known as the Chapel of the Invention of the Cross. In 614, a Persian army destroyed the church and the True Cross was taken away, but in 631 the Byzantine emperor Heraclius negotiated its return. The Arab conquest in 638 was initially less disruptive, as Christians were treated with tolerance, but 300 years later the entrance to the basilica was converted into a mosque, and in 966 the dome was destroyed by fire during anti-Christian riots. 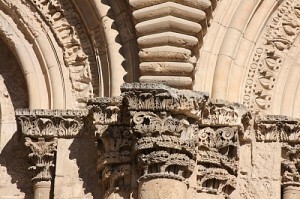 In 1009, the fanatical Fatimid caliph al-Hakim ordered the destruction of the church. The Byzantine emperor Constantine IX Monomachus (1042–1055) funded its rebuilding, but on a different plan, with the entrance on the south side. This was the church that drew pilgrims from all over Christendom in the later 11th century, and for much of that period the Muslim rulers of the city treated them well. It was only after the capture of the city by the Seljuk Turks in 1077 that rumors began to circulate that Christian pilgrims were being ill treated and denied access to the church. The liberation of the holy places, the foremost of which was the Holy Sepulchre, was an important motivation for the First Crusade between 1096 and 1099. After the capture of the city by the crusaders in 1099, eyewitnesses tell how the survivors of the expedition prayed in the Church of the Holy Sepulchre, which struck them as unusual because it was open to the sky. 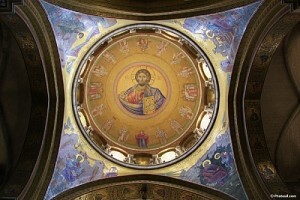 During the next half-century, the church of Constantine IX Monomachus was largely reconstructed. Although the building’s footprint was preserved, the church acquired the attributes of a cathedral on the Western model. The holy garden became the basilica of the crusaders’ church, and the rock of Golgotha was given its own chapel. The Church of the Holy Sepulchre was reconsecrated on July 15, 1149, 50 years to the day after the capture of Jerusalem by the First Crusade, but in fact work continued on the building for some years afterward. Nevertheless, the church of the crusaders is essentially the church that is to be seen today. The crusaders’ church attracted enormous numbers of pilgrims, whose entry and circulation had to be controlled: the twin doorways can still be seen, although the elaborately carved lintels under which the pilgrims passed were removed after the earthquake of 1927 and are now in the Rockefeller Museum in Jerusalem. The right-hand door was blocked up after the Muslim reconquest of the city in 1187. However, even during periods of Muslim occupation, pilgrims continued to be admitted to the site, and indeed Western leaders were anxious to negotiate rights of entry. Some features of the medieval church can no longer be seen—for example, the tombs of the first rulers, Godfrey of Bouillon and Baldwin I, which were removed in the early 19th century when the Greeks were carrying out restoration work. 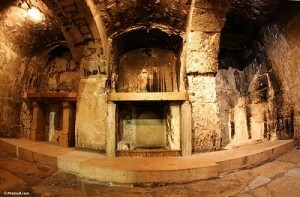 All of the kings of Jerusalem up to 1187 (except Queen Melisende) were buried in the Calvary Chapel. As 12th-century maps reveal, the Holy Sepulchre in Jerusalem was the spiritual focus of Christendom and its most important pilgrimage center. The church was laid out to enable pilgrims to move from chapel to chapel, their visit culminating in the Holy Sepulchre itself. At Golgotha, to mark the completion of their pilgrimage they would leave the crosses they had carried on the journey, and a great pile of these would be burnt on Easter Eve. 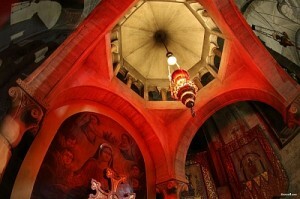 On Holy Saturday, the ceremony of the Holy Fire took place. The patriarch entered the edicule, where the Easter Fire was kindled and then passed from hand to hand. This was witnessed by the chroniclers Ekkehard of Aura in 1101 and Caffaro in 1102. Despite the mutilations of the centuries, the Holy Sepulchre remains a fascinating complex of structures and is of key importance for several phases of medieval architectural history, ‘imitations’ being built all over Europe. Today, the Church of the Holy Sepulchre is one of Jerusalem’s main landmarks and continues to draw many pilgrims and visitors.